The other half of the defunct hip hop duo with Will Smith shares how he continues to reinvent himself. BRANDING. 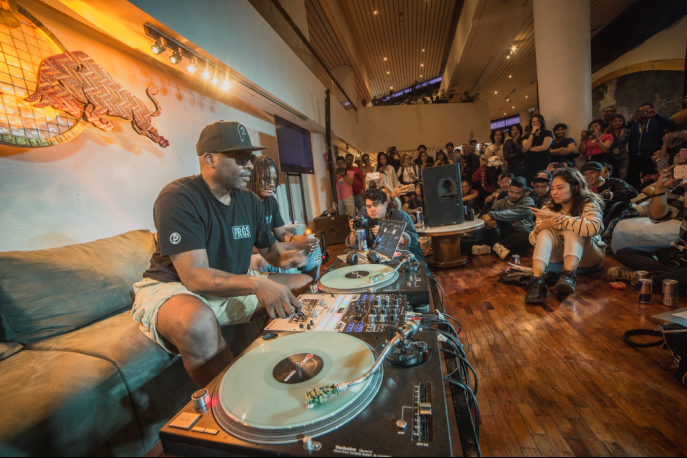 DJ Jazzy Jeff believes branding matters as much as making music in the entertainment industry. The music artist recently held a workshop with local artists and members of the media early January at the GSIS Museong Sining, Pasay City. Photo courtesy of Monsters Centaur Production Inc.
Like everything in business, success comes when you work hard and love the work. The entertainment industry runs the same, only the artists run their empires with creativity and passion, manning the show like a CEO. Hip Hop legend DJ Jazzy Jeff or Jazz has always loved music. Growing up in a town where DJs are born in almost every street, it is easy to fall in love with hip hop for the Philadephia native. It was in the late 80s when Jazz hit it big. In a rare serendipitous occasion, Jazz’s supposed partner rapper did not show up on a gig when a new kid, Will Smith, came up to him and asked if he could jam. The first night they danced to the tunes of each was a history in the making. Since then, the pair, who named themselves as “Jazzy Jeff and the Fresh Prince,” won two Grammys together, marking their names in the music industry. While the duo eventually broke up, Jazz has continuously made music and collaborated with different artists as a DJ and a producer. “Most of the arts, you start it because you love it. When you start to realize you can make money out of it, it starts to become a job and very few people can turn the job into a career. You need to work for that,” Jazz explained. Two decades later, as the music industry battles piracy and slumping original music purchases, Jazz turns to social media to produce the music he always wanted. Musicians could easily share their new materials to fans, even without a producer backing them up, or just set up a boutique shop for a certain niche. “I never played well with the music industry of sorts, but with social media, you can focus on who you are and what you want to do and look for the people who like what you could give and they could easily reach you. By then, you’d be fine,” Jazz shared. For the acclaimed DJ, the freedom gave artists the creative space to produce quality materials, and expects musicians in the future would embrace their names as a brand. “Right now, artists are becoming more aware that they are a brand,” Jazz shared.